Recently, since I was in the area, a friend and myself visited the Princeton Campus. I was kinda curious, being a student of History and Education and all, and wanted to see what all the hype was about. I have to say... the campus is a gorgeous place! The architecture of the buildings alone is exquisite! The area has its own charm of being a community set apart from others. With an area so rich in history and beauty, I can see why anyone would hold a place like this so dear to their hearts. Below are some pictures I took of the campus, as well as captions explaining what they are. Dr. John Witherspoon, an eminent Scottish clergyman, was president of the College in the latter part of the 18th century, and during his administration the College achieved a national reputation. A noted scholar, theologian, and patriot (the only college president to sign the Declaration of Independence), he left his mark on both clerical and civil affairs. In 1896, the College of New Jersey became Princeton University. Princeton Professor Woodrow Wilson (Class of 1879), delivered the famous sesquicentennial address, “Princeton in the Nation’s Service.” Seven years later, Wilson was elected the 13th president of Princeton University. His interests focused on reforms in the field of undergraduate education and reestablishing the close rapport between student and tutor that had been part of the early tradition. His influence and insights remain a vital part Princeton University’s vision. Women were first admitted as degree candidates in 1969, and in the 1970s African American and other minority students joined women as an integral part of the University. The 1980s saw the expansion of the academic programs of the University, and when Harold T. Shapiro became president in 1988, total enrollment had risen to approximately 6,000 undergraduate and graduate students. In 2001, Shirley M. Tilghman became Princeton’s 19th and first woman president. In the diversity of its students, the scope of its scholarship, and the excellence of its endeavors, today’s Princeton embodies the best traditions of its founders. This is the "Dinky Station", known for the single New Jersey Transit rail car that carries passengers back and forth from Princeton University to Princeton Junction. Because only one rail car is used, University passengers over the years have fondly dubbed it the "Dinky". This is a sampling of the kind of architecture Princeton is known for. These areas are located on University Ave., just before you reach the University Store. This is the famed three-story University Store. Behind it is Blair Hall, home to the Princeton Chapel Choir. Alexander hall was built around 1892 and named for the founder of the Princeton Theological Seminary. Woodrow Wilson was also inaugurated here as University president. It also is the University's premier performance venue for a wide variety of events presented by the Department of Music as well as student and community organizations. Nassau Hall was the first and largest building erected on the Princeton Campus, then the College of New Jersey, built in the early 18th century. During the American Revolution, it was caught between British and Continental firing lines at the Battle of Princeton. The Continental Congress met here for brief periods throughout the war. After receiving news of a treaty that would ultimately end the war with Britain, Washington agreed to sit for the famous Charles Wilson Peale portrait, which replaced the portrait of King George III in the prayer hall. Following the Civil War, in 1868, the Reverend James McCosh, professor of moral philosophy at Queen’s College, Belfast, assumed a presidency that was to last for 20 years. During his administration the College’s first building to house a separate library, the Chancellor Green Library, was erected, nine endowed professorships were established to strengthen the faculty, and postgraduate study was encouraged. With the awarding of its first two Ph.D. degrees in 1879, the College was destined to become a university. Princeton's Motto... "Under God's Light She Flourishes"
Princeton also has an annex facility to the north on Rt. 1, which is separate from the main campus, called Forrestal. The facility was named after United States Secretary of Defense, James Forrestal, who graduated from Princeton in 1915. Forrestal was known for helping to reshape the government with the National Security Act of 1947. He was the first to be given the position as secretary of defense in the National Security Council, created by the Act, but would only serve for 19 months, committing suicide in 1949. Controversy ensued when it as suggested the campus be named in his honor. 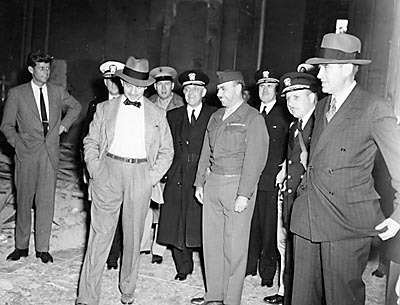 James Forrestal, pictured wearing the bowtie. "James Forrestal invented the Office of Naval Research -- it got us started here at Princeton and is still the only item in the Navy's budget mandated by Congress," Bogdonoff told Merritt for the book. "Every research university ought to pay homage to him." In 2002, a special book was written by J.I. "Jim" Merritt to commemorate the 50th anniversary of the Forrestal campus. Merritt said that Seymour Bogdonoff, the Robert Porter Patterson Professor of Aeronautical Engineering Emeritus, came to the University administration about four years ago with concerns about the Forrestal legacy. "He felt that many people didn't know what had gone on out at Forrestal and how important Forrestal had been to the University's research agenda over the years," Merritt said. "He was worried this history was going to be lost." Laurance Rockefeller helped to renovate the facility by the early 1950s, purchasing lands that nearly doubled the size of the University's land holdings. It was in this time that Lyman Spitzer, an astrophysicist, created his "stellarator"; a safer alternative to nuclear fission. Spitzer is credited for this advancement in fission technology through an idea he had while skiing in Switzerland. He believed he could recreate the same kind of reactions that power the sun and stars, and turn it into a cheaper, safer alternative to nuclear fission. This program was known as, appropriately enough, Project Matterhorn. Project Matterhorn was organized at Princeton, and run by the government. This project was also know to be the forerunner to Princeton's Plasma Physics Laboratory at the Forrestal Campus.